People don’t buy house, they buy homes. The number one reason a buyer purchases a home is because it “felt home.” It was warm, inviting and the buyer made an emotional connection with the home. When have you ever heard of an empty room described as warm and inviting? Sterile, cold and uninviting are the three most popular words to describe an empty room. We don’t decorate. We stage homes to sell; it’s marketing. We don’t stage your home not to our taste, or yours. We want your home to appeal to the broadest range of potential buyers. We use demographic staging to reach buyers looking in the area where your home is located. A home in German Village or the Brewery District will require a different style than a home in Dublin or Blacklick. We have the ability, expertise and most importantly the furnishings to stage all the above. No matter where your home is located, or the style, we’ll create emotional connection points throughout the home that will help buyers fall in love and see it as their home. Without furniture, there is no frame of reference. How big is the room? Without furniture it’s incredibly difficult to tell the scale and size of a room. When the buyer does not have answers to their questions-they walk away. What is this room for? Many times a buyer can’t even tell if it’s the living room or dining room in a vacant home. Don’t keep them guessing, because it only distracts them from considering the home as a purchase. When a room is kept empty, buyers focus on negative details. Can you imagine a brand new Mercedes without a paint job? Do you think people would notice the beautiful car or the missing paint? It’s so much easier to notice that crack in the wall, or the chip in the tile when there is nothing else to look at. Home Staging capitalizes on the positive aspects of a home, while de-emphasizing negative aspects in order to position a home that will make an emotional connection with buyers. Only 10% of home buyers can visualize the potential of a home. Nine out of every ten people walking in your home have no imagination of the wonderful possibilities your home has to offer them. They just can’t picture it. Don’t let a simple thing like no furniture or limited furniture ruin your sale. Don’t take those odds; they will hurt you in the price significantly! 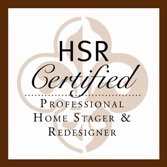 Because a price reduction costs more than home staging. The longer a home sits on the market, the harder it can be to sell. Staging it correctly before it’s listed is key. Buyers looking for a home often use online apps when searching for a home. They simply set the criteria and wait for the notifications. When your home fits buyer’s criteria they’re sent an alert and you have a flood of showings. Have your home prepared and looking like a model home before you list. If you miss the opportunity to grab your buyers’ attention they’ll move on to a home that has the “Wow” factor. In today’s market, making your home stand out among the competition is critical. Everyone is shopping online first. That means the online photos are the FIRST IMPRESSION – make it count. We include professional real estate photos of your home for your agent to use in their marketing. It’s included in our vacant staging packages; we know it’s that important! Staging a home won’t get that “Wow” factor online if you don’t have professional photos. In today’s housing market, standing out is critical. Element One will partner with you and/or your agent to make your home market-ready, helping you to achieve the greatest possible outcome in the sale of your home. Working with what is available and as cost effectively as possible, we will create a balanced environment that will stand out and connect buyers to the possibilities of their new home!